How to make a fist is one of the first things taught in karate, kung fu, taekwondo, or any art that includes punching or striking. Thus it is surprising that many practitioners have never been taught how to form their fist correctly. I’d guess that most readers of this article are pretty confident that they are already making a proper fist. However, over the years, when I’ve conducted seminars with groups other than my own students, I’ve invariably found that many participants, including many of higher rank, do not make a proper—or at least an effective—fist. Even among my own students, improper technique very often creeps in, much to my annoyance. And, much to my chagrin, I sometimes catch myself at it, too. Many karate, taekwondo and other practitioners get away with bad fist formation for years because they never actually hit anything with any force. Most of their punches are to the air, without contact. When they do make contact with a target such as a makiwara (practice hitting board or post) or heavy bag (even ribs), they feather the technique so much that their impact is more of a forceful pat or push than a real punch. Protective gloves while useful to prevent possible injury only serve to cover up this problem. Hitting a makiwara with an improperly formed fist is at least a waste of time and is often a cause of injury. At worst, it develops bad technique that can take great effort to overcome. Students who practice this way, either consciously or mindlessly, are deceiving themselves. Their practice is not giving them the optimal benefit it should and they are unprepared for actual combat. Among these people are the “karate and other martial arts experts” you hear about breaking their hands or wrists if they ever get involved in a real fight. The same thing happens to boxers who get too used to the wrapping and padding and then break their hands in minor squabbles on the street (Mike Tyson breaking his hand punching an annoying dweeb in a Harlem clothing store springs to mind). I know what you are thinking. “Oh, here comes the lecture about striking with the first two knuckles of the fist and not the other knuckles that don’t have strong bone alignment internal to the wrist, and keeping the top of the fist aligned with the plain of the forearm.” Not really. I have assumed that if you are reading this article these lessons have long been digested. I am talking about something completely different. Instead, the most common mistake I’ve seen in making a fist is something you may not even be aware of – the tendency to over-tighten the muscles of the hand in such a way that the soft tissue between the knuckles is tautly stretched and, as a result, the skin, muscle, connective tissue, and knuckles are stressed. The result is that beneath the surface of the skin, the bones of the hand and fingers (especially the first two) are pulling away from each other, a sort of flattening or flarring out—definitely not an example of e pluribus unum. 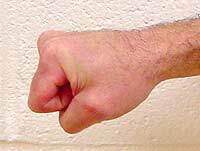 When you make a fist in this manner, then hit a makiwara—or, perhaps, a person—really hard you might damage yourself as much as you damage your target. If your target is harder than expected, or if it twists unexpectedly with the impact, you can damage yourself more than you damage the target–split skin and torn and/or strained muscle between the knuckles. Often too, you damage the knuckle surfaces. Sometimes you get broken bones. Even if the only injury is split skin, there is a danger of infection and, worse, you can’t whack anything with gusto until it’s healed. In a fight that might limit follow-up punches with the same hand if you are aware of injury, but if not, and adrenalin has masked feedback, you might just end the fight successfully only to find you have injured yourself more permanently than your opponent. In short, an improperly formed fist is hard and brittle, like a plastic bag packed completely full of ice cubes. There’s some heft there, but the bag is easily torn and the ice cubes are easily cracked or crushed. A well-made fist is soft, supple, and pliable on the surface. The hard mass beneath the surface can be shaped as needed for optimal use, depending upon the situation and the target. It’s like a thick rubber bag filled with BB shot, which can be gathered or shaped at will. 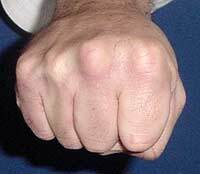 To make a fist optimally, you must squeeze the knuckles together, rather than stretch them apart. Likewise, you must squeeze the bones within the hand together, so that they reinforce each other and work as a large cumulative mass rather than as a group of individual small bones. Over-squeezing, however, is counterproductive, as it causes the hand as a whole and the individual bones within to buckle on contact. It’s also counterproductive to squeeze the hand at all except upon impact. Squeezing before impact slows you down and robs power from the punch; maintaining the squeeze after impact slows you down and leaves you vulnerable to trapping and counterattacks. What doesn’t matter much at all is the position of the thumb. 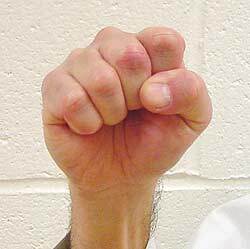 It’s actually easier to make a proper fist using the fist formation found in such styles as Isshin Ryu, in which the thumb tip is pressed against the fold of the second knuckle of the forefinger. When making a fist with the thumb tucked under and bracing the third knuckles of the forefinger and middle finger, as in Shotokan and most Shorin styles, care must be taken to leave the thumb relaxed, but not so relaxed as to hang below the fist. If the thumb is tense, it acts as a lever pulling the bones at the base of the hand apart. Contact in that case can result in lower hand and wrist injuries. 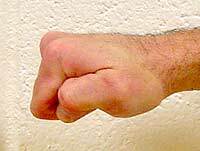 At left the fist is compressed internally, while it is pliable and supple on the surface – a strong fist. 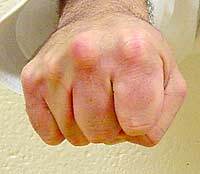 At right the fist is over stressed, internal tension actually working to pull the first two knuckles outward and away from each other – an internally weak fist. Here is a simple test to determine whether a fist is too hard and tense or, on the other hand, too loose. Using the thumb press into the gap between the fist and second knuckles of the fist (Don’t use the thumbnail). If the thumb is able to penetrate the fist, or if the thumb cannot penetrate but still causes appreciable pain, the fist is not optimal. If the fist is optimal, the pressing thumb is merely a nuisance. Here is another way to feel difference between the two kinds of fists. With your thumb still in place between your two knuckles, first slowly compress the fist. The fist should be still relatively loose. You should be able feel the fist and the two first knuckles compress together. Now tighten the fist using more muscle tension. If your hold your thumb underneigh (bracing the third knuckles of the forefinger and middle finger) you will feel the first knuckle separate from the first (the first digit pressing the bottom of the fist finger inward, thus leveraging the striking knuckle outward). You will also feel the little finger squeeze in such a way that the top knuckle pulls downward and inward – this pulling action distorting the whole fist and breaking its consolidated structure.